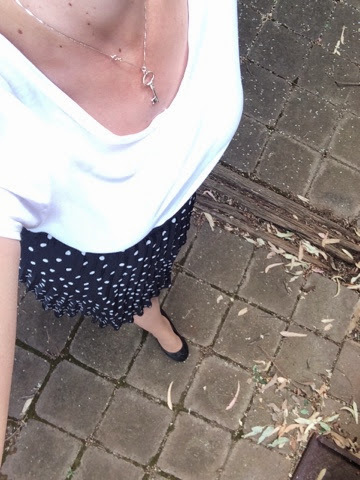 Today, I thought I'd post about my outfit, being that I found a spot in the yard to take a few photos this morning. I'm getting better at the timer camera app and found a better place in the yard to take it. Don't mind the green waste bin or the barbecue, will you? 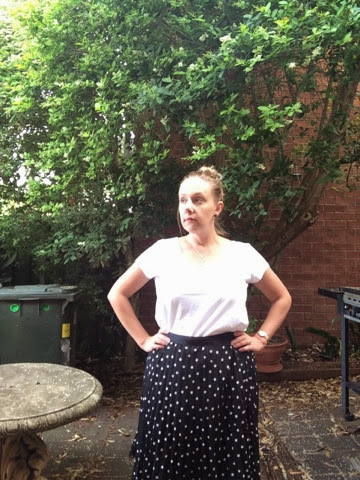 Today I'm wearing one of my bargain $5 Kmart basic tees with a Khoko skirt from Harris Scarfe that I bought AGES ago, never wore and very nearly got sold at a failed market stall. It was rescued and reborn recently. I always thought I couldn't do a midi length, being short, but I think this works. What do you think? I'm looking at my shoes! It's a thing now! 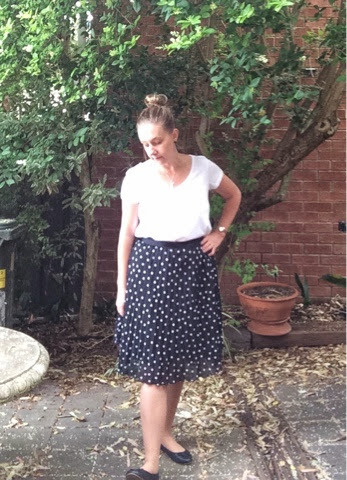 Said shoes are Target leather ballet flats which were about $40 as I recall, because I ummed and ahhed about spending that much on Target shoes #frugalista. Still, you can't really go wrong with black leather ballet flats so I consider it an investment. That's what I'm thinking as I look at them, speculatively. 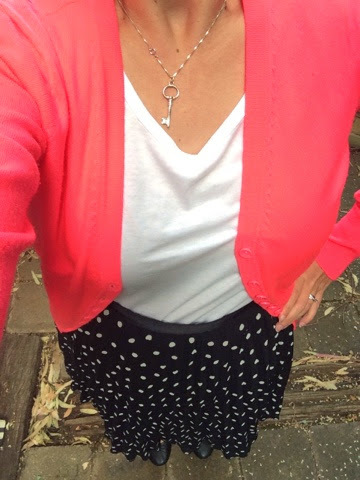 It was a bit cool in the morning so I threw on a Cotton On cardigan I bought earlier this year on sale for $15. You can't tell in the photos but it is a shockingly neon pink and gives that pop to a monochromatic outfit. Finally, my silver key necklace was a Christmas gift from my bestie a couple of years ago. 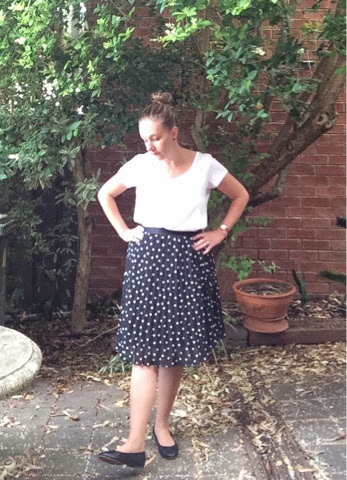 Were it not for the shoes, I could have got this outfit in the Under $50 Challenge!